Austrian microphone company Lewitt has found many fans in recent years with its affordable Vienna-designed, China-built microphones. They're known for combining sturdy construction with bright, detailed sound, all at a price within reach of home recordists and project studios. 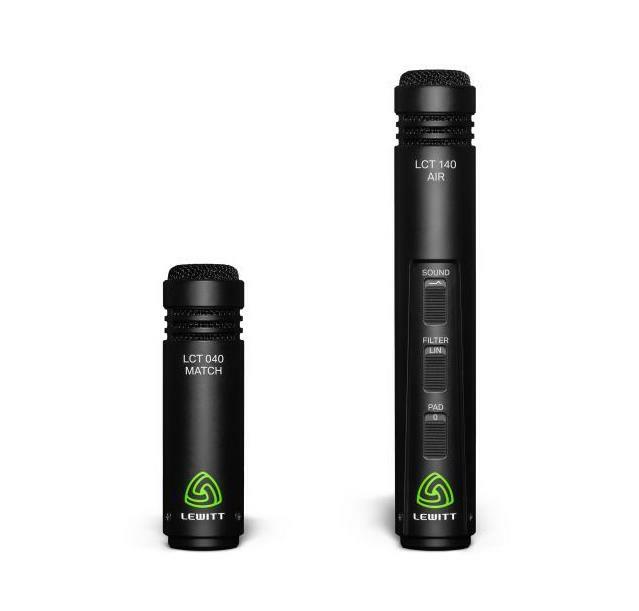 Ahead of NAMM 2019, which is set to begin in Anaheim next week, they've announced their most affordable small condenser mic to date—the LCT 040 Match—along with the LCT 140 Air. The LCT 040 Match will be available for $99 individually or $189 for a matched stereo pair. It's a small-diaphragm pencil mic "with instant transient response for the natural qualities of acoustic instruments," according to Lewitt. "Ranging from acoustic guitars to drums and strings, every moment is captured in fine, crisp detail, with pleasant high-end." The new LCT 140 Air, which will list at $149, adds a nuanced "airy" mode to the brand's established LCT 140 mic. The small-diaphragm pencil condenser allows you to toggle between the "airy" setting and the original's linear response mode. These are just the latest entrants to the LCT range, which includes numerous small- and large-diaphragm condensers—like the LCT 240 Pro and LCT 640 "Authentica"—as well as tube recording mics like the LCT 940 Reference Class FET, all at a range of price points. Be sure to check back for availability of the new mics soon. And in the meantime, click here to see all Lewitt mics available on Reverb.